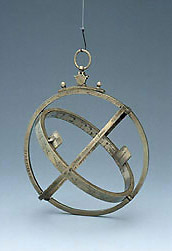 The astronomical ring dial achieved popularity in the 16th century after it had been modified and promoted by Gemma Frisius. It was therefore especially appropriate for the instrument maker Gualterus Arsenius to sign this instrument as 'Nepos Gemmae Frisij Louanij fecit 1567' - made by the nephew of Gemma Frisius at Louvain in 1567. The instrument is in the form described by Gemma Frisius, although the innermost sliding ring appears to be a later replacement.